3.1.1 Why is there a hole/missing face in my DM? 3.1.2 Why does my mesh fall completely apart when I shoot it? Why can’t I just shoot a hole in my DM? How to stop DM from breaking apart in a single hit? 3.1.3 Why doesn’t my DM stick to the ground when I shoot it? It just flys off and bounces around. 3.1.4 Why is my DM floating above the ground, or why is collision not matching the mesh? Why doesn’t the collision of my DM match my Static Mesh where I setup my collision? 3.1.5 Why doesn’t my mesh break when it falls? 3.1.6 Why is my collision wrong if I scale my DM? 3.1.7 Why does my projectile mesh not fracture my DM? My bullet (mesh) doesn’t fracture the destructible. What’s wrong? 3.1.8 When I fracture my mesh why is there not material applied to the chunks on the inside? 3.1.9 How do I setup my DM so that it can receive different damage from different weapons and not fracture? How to not receive damage if below a certain amount? 3.1.10 Why are some settings not honored when I simulate Physics on my Destructible? 3.1.11 Why doesn’t my DM cast shadows? 3.1.12 My character is always blocked by the chunks. How can I turn off collision for the DMs or my character? 3.1.13 How do I customize the shapes of the chunks in my DM? 3.1.14 How do I create more than one destruction depth? 3.1.15 Can I change my Destructible meshes settings at run-time? 3.1.16 Can I fracture a mesh at run-time, like fruit ninja? 3.1.17 When using Debris settings all my chunks disappear at the same time? 3.1.18 Why isn't my Destructible meshes chunks affecting my Nav Mesh, or How do I make my Nav Mesh update for my Destructible? 3.2.1 Why doesn't my destructible mesh work on mobile? 3.3.1 If I use high speed object why doesn’t it collide with my DM? It just goes right through. 3.3.2 Are Destructible assets handled on the CPU or GPU? Why? 3.3.3 Why do I get lag when I fracture my Destructible? 3.3.4 Why do my destructible chunks/pieces disappear if I have a lot of DMs in my scene? 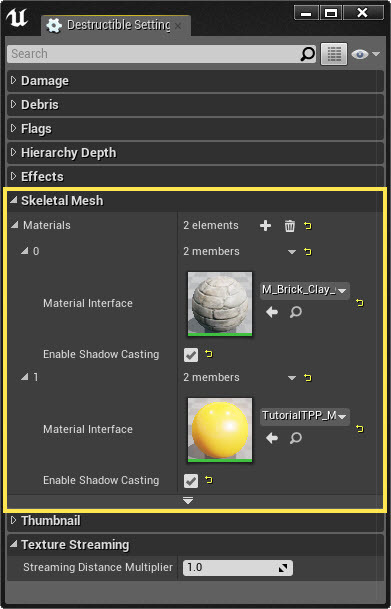 This Troubleshooting guide attempts to cover some of the more common problems that people come across when they first dig into using Destructible meshes in Unreal Engine 4. This guide is by no means meant to be completely comprehensive but a living document as the engine changes so too can we add and alter advice presented here. The guide is meant to be a great first step for artist trying to get the most out of the engine's destruction system. As with any system there are limitations that are restricted to how a mesh must be setup or configured to work properly. 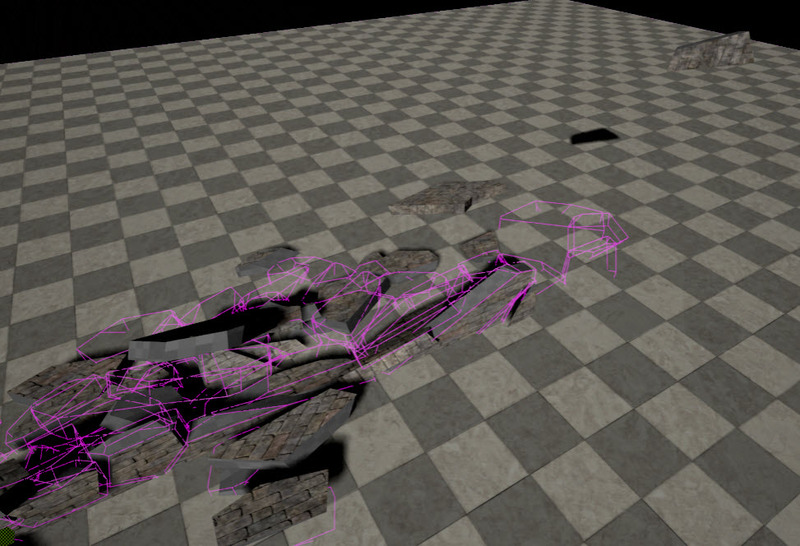 Destructible meshes are no different they must adhere to their own limitations. 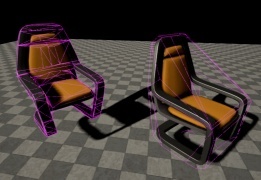 NVIDIA's documentation for setting up Destructible meshes would be a good place to start along with this guide that will cover a lot of common issues people run into. Why is there a hole/missing face in my DM? Extremely long thing triangles: add an edge loop to keep the triangles from getting too long. N-sided Polygons: Quads and Tris are best to use. UE4 will do its best to triangulate the mesh for n-sided polygons, but this is sometime inevitable. Planar Assets: Single sided assets are not ideal. These will fracture, but you can sometimes get artifacts, becaues the interior geometry does not know how to build itself in this situation. Non-closed Geometry: Having multiple boxes that are closed overlapping, as an example, will cause holes to be generated. You will need to make theses individual meshes as part of a single closed mesh to get proper results. Why does my mesh fall completely apart when I shoot it? Why can’t I just shoot a hole in my DM? How to stop DM from breaking apart in a single hit? Make sure that you've setup the mesh to have a proper Support Depth. This is what allows chunks to stick together until they have received enough damage to break free from the other chunks. Also, depending on the amount of damage being applied you may want to increase the Damage Threshold and adjust the Impact Damage values to get a desired result. Why doesn’t my DM stick to the ground when I shoot it? It just flys off and bounces around. You will want to set the flag for Asset Defined Support, with corresponding selected chunks and the Chunk Parameter is Support Chunk set properly, or you can use World Support. When either/both of these are set the destructible will "stick" to any static geometry in your game so long as it has not received enough damage to break free. This also requires that at least a Support Depth of 1 is set to work properly as well. Why is my DM floating above the ground, or why is collision not matching the mesh? Why doesn’t the collision of my DM match my Static Mesh where I setup my collision? Unlike the Static Meshes you do NOT have the ability to create custom collision for your destructible assets, at the moment. This may change in the future, but is not currently planned. 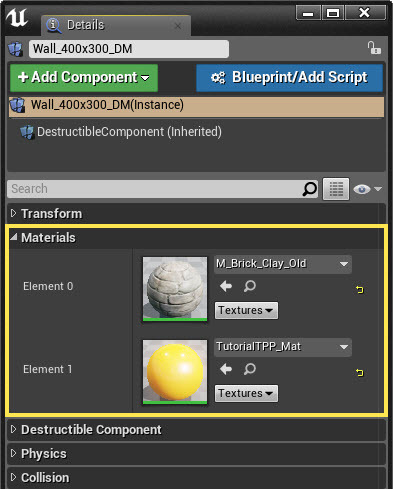 When a destructible asset is created there will be two collision sets created, if you're using Unreal Engine 4 to create your DM, but more if you're using more destruction depths from an asset created in PhysXLab. The first collision depth will be a Single Convex Hull that will be around you mesh. The second set of collisions will be for the fracture depth. A Single Convex Hull will be created around each chunks. 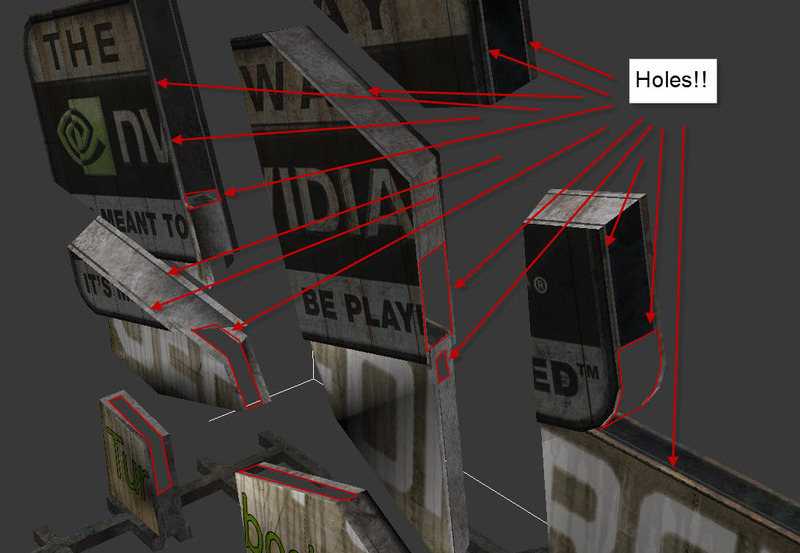 These collision hulls may or may not always tightly bound the graphics mesh. Because of this, there can be inconsistencies in what you see with the graphics mesh and the collision mesh in your game. See the images below for more details. Why doesn’t my mesh break when it falls? Why is my collision wrong if I scale my DM? When you scale a destructible mesh make sure that you are scaling evenly on the XYZ axis. With the non-uniformly scaled mesh the collision and the graphics mesh will often not line up. You can clearly see in this scene using the console command PXVIS COLLISION that this is the case. The collision hulls are not lining up with their graphics mesh. Physics will not act accordingly either. Why does my projectile mesh not fracture my DM? My bullet (mesh) doesn’t fracture the destructible. What’s wrong? If you want use a mesh as your collision, you will need to setup the Collision Presets to get this working correctly. Now that you've set up the Projectile BP you will now need to set the Destructible. When I fracture my mesh why is there not material applied to the chunks on the inside? When the mesh is fractured it will create geometry that will represent your interior faces. There are two ways to apply materials to these interior faces on your mesh. Select the Destructible in your viewport then assign the material via the Details panel. How do I setup my DM so that it can receive different damage from different weapons and not fracture? How to not receive damage if below a certain amount? 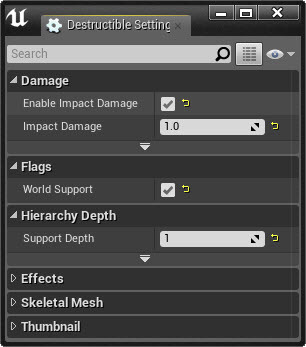 This can be done by adjusting a couple of values in your Destructible meshes Damage settings tab. Damage Spread: How easily the damage applied at the hit location can radiate to surrounding chunks. (Optional) Impact Damage: How much damage is applied with an impact. Damage Cap: Limits the amount of damage a single hit can have. Accumulate Damage: If a chunk doesn't receive the full damage amount to break it free it will "remember" what amount of damage has been applied. Why are some settings not honored when I simulate Physics on my Destructible? Why doesn’t my DM cast shadows? 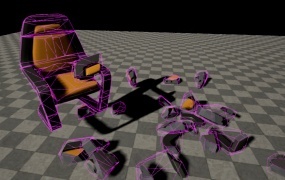 This is commonly an issue when bringing in a Destructible mesh that was created using PhysXLab. 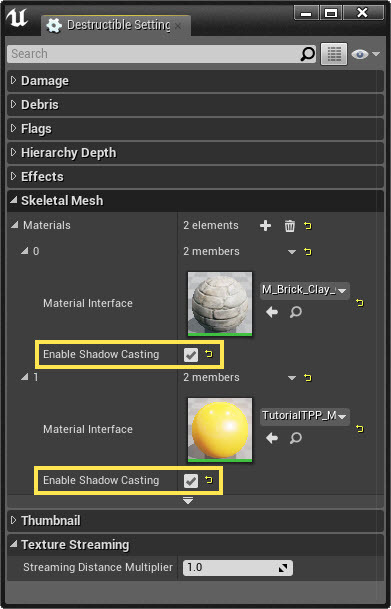 Open Destructible Mesh Editor > Skeletal Mesh tab > select a specific material > set Enable Shadow Casting to TRUE(checked). By default, on all destructible meshes created in Unreal Engine 4 this will be enabled by default. For meshes crated in PhysXLab this is not the case. This will need to be enabled by using the settings above. 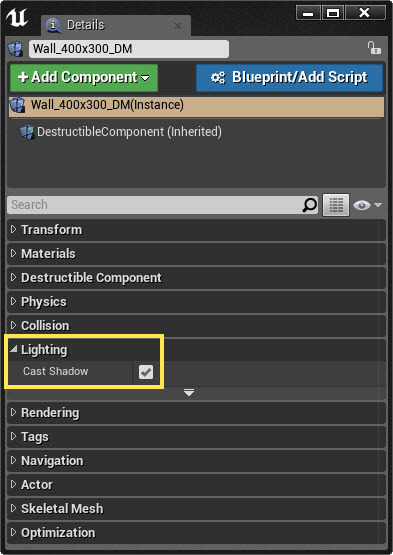 If you're still not seeing shadows being cast for your destruction mesh you can also try looking at the settings in the Details panel when you select your destructible in your scene. My character is always blocked by the chunks. How can I turn off collision for the DMs or my character? Depending on how you've got your destructible mesh setup, you can run into problems where your character may be blocked by a small to moderately sized chunks. This can be problematic for gameplay in some instances. To get around this there is an option called Large Chunk Threshold that can be adjusted to prevent just this. This is a mesh specific setting, meaning that you can only change this for the mesh in the scene viewport and not in the Destruction Mesh Editor's settings. How do I customize the shapes of the chunks in my DM? 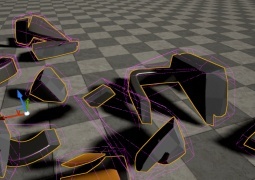 In Unreal Engine 4 you cannot customize specific chunks in this manner. 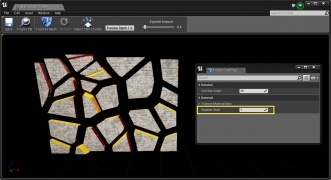 You will need to use NVIDIA's PhysXLab to access their Slice and Cut Out methods to do this. 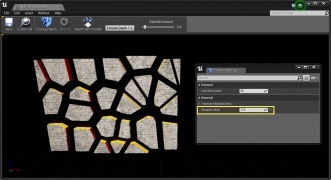 If you want to try different variations of the default (Voronoi) fracture method in the Destruction Mesh Editor you can adjust the Random Seed value to try different patterns. The benefit of the Random Seed as well is that anytime you want to get that same pattern again you can just enter that number to get the same exact pattern. How do I create more than one destruction depth? 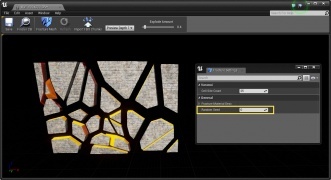 Currently, you can only create a single destruction depth in Unreal Engine 4 using the Voronoi fracture method. Can I change my Destructible meshes settings at run-time? Can I fracture a mesh at run-time, like fruit ninja? When using Debris settings all my chunks disappear at the same time? Why isn't my Destructible meshes chunks affecting my Nav Mesh, or How do I make my Nav Mesh update for my Destructible? This will need to be enabled on a per-instance basis. 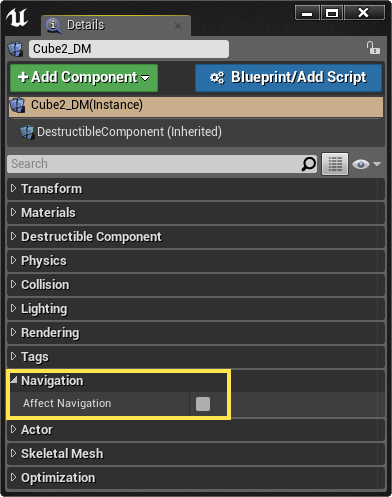 You can select your destructible, then in the Details panel locate the tab for Navigation. Under this tab you will see the option for Affect Navigation. Once this is enabled this will allow your destructible mesh to update the Nav Mesh at runtime. Why doesn't my destructible mesh work on mobile? This is currently not support for mobile devices in any form. Destructible and Cloth assets depends on APEX to work. There are performance reasons that this must be considered when using. This may be supported in the future, but it is not currently planned. If I use high speed object why doesn’t it collide with my DM? It just goes right through. With any game or project that is using real-time simulations you'll probably run into something like this at some point. There is a limitation of how accurate a simulation can be without sacrificing performance for accuracy or accepting that some things will not be as accurate to get better performance. As an example, if we were to create a mesh to represent the bull of a gun it would be improbable to expect the small bullet mesh to react like the real world. Scale and speed play a big factor in the physics simulation that would happen. Let's say the bullet is moving at a very high velocity when it is at the point of impact for the destructible. The bullet would simply pass through and not affect our destructible at all. You can improve physics simulations though, within reason, by going to the Project Settings > Physics > enabling and using Sub-Stepping. For more information see the links below. Are Destructible assets handled on the CPU or GPU? Why? NVIDIA's APEX Destruction and Cloth are both handled on the CPU. While this is NVIDIA tech that has been included with the engine, it has to be GPU agnostic so that anyone using the Unreal Engine 4 has access to use them. Why do I get lag when I fracture my Destructible? Using a lot of Destructible assets in your scene will cause this to happen. Even using a few Destructibles with a lot of fracture chunks will cause this to happen. This is because NVIDIA APEX Destruction is handled on the CPU rather than the GPU. Depending on your system specs this can cause a bottle-neck in performance. When a destructible is fractured, depending on the number of chunks you've chosen to use, these are all simulating physics bodies. If you are simulating a lot of physics objects you are more likely to see these types of performance issues. 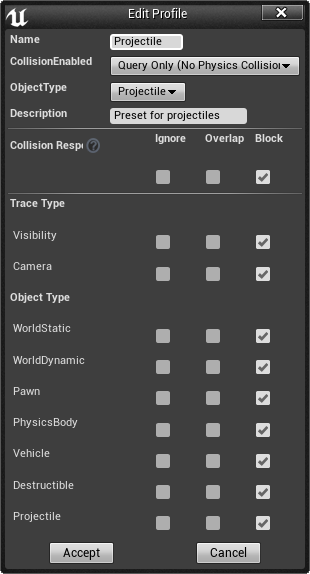 You can try using fewer destructible assets, reduce the number of fracture chunks for each mesh, or using some of the settings in the Destructible Mesh Editor Settings panel to remove chunks from the scene more quickly to free up the CPU usage. If you're seeing performance issues that you're not sure you should first start by having a look at how to profile your game for these types of issues. Take a look at the following links for more information and demonstrations of profiling. Why do my destructible chunks/pieces disappear if I have a lot of DMs in my scene? There is a hard-coded value of 2000 chunks that can be present in a scene at a single time. This is done to keep the CPU from being overloaded and killing the FPS completely. This limit is for all destructible assets in the scene and not specific to each mesh. As an example, if you have 4 meshes with 500 chunks each you have reached the cap of 2000 chunks per scene. Anything over this amount all the chunks would be removed/destroyed immediately.